Can we reduce the US prison population by half? Over five years ago, a colleague and I began a conversation that eventually led to the development of the Smart Decarceration Initiative. The aim of this initiative is to advance policy and practice innovations in order to substantially reduce incarceration rates, while simultaneously addressing racial and behavioral health disparities in the criminal justice system and maximizing public safety and well-being. What is meant by “substantially” reducing incarceration rates is a reduction by about a million people over the next 10-20 years, which would essentially cut the US incarcerated population in half. This is a very ambitious goal. What motivated this goal was not merely naïve optimism, but rather our accounting of growing evidence that the era of mass incarceration might be coming to an end, or at least hovering at a tipping point. The numbers were suggesting it – after nearly four decades of exponential increase, the incarceration rate in the US plateaued in 2009, and it has decreased slightly every year since. Despite that leveling off, upwards of 13 million adults in the US spend time in jail or prison every year. There was also a growing awareness of accumulating evidence that incarceration was not, in most cases, an effective tool for providing rehabilitation or ensuring public safety. Quite the opposite: incarceration is extremely costly – over $50 billion per year – and most people released from prison end up coming back within just a few years because of new criminal charges. It’s not surprising that people leave incarceration worse off; although about 75% of incarcerated individuals are in need of substance abuse treatment, only 11% receive any while behind bars. The fact that jails have become repositories for people in poverty with mental illnesses is now featured in prime time television. And the injustices of mass incarceration, particularly inequities in how incarceration was dramatically over-applied to African American and Hispanic populations, are no longer being discussed only in specialized academic settings. Instead, they are the stuff of bestselling books such as The New Jim Crow and films such as 13th, winner of four Emmy awards. But what was truly surprising was how quickly the political rhetoric, on both sides of the aisle, pivoted from a “tough on crime” message to one of general agreement that our criminal justice system is broken and ineffective. The failings of the criminal justice system was a subject largely untouched by any presidential candidate for years, including in the 2008 and 2012 elections. But by the time the 2016 presidential election season commenced, criminal justice reform had become a primary policy issue for nearly every candidate, democrat or republican. Many states, both red and blue, have been making significant advances in changing policy to reduce the use of prisons. And in his last presidential term, President Barack Obama enacted several major executive orders to decrease the use of incarceration, and in his final days as president he wrote about the role of that office in criminal justice reform. The emerging era of decarceration is facing a formidable political challenge. It seemed that the time for decarceration had arrived; we were experiencing the “perfect storm” of economic, social, and political factors that would mark the beginning of an era of decarceration. The man elected was the one candidate who not only discounted the need for criminal justice reform, he regularly misrepresented facts about crime rates and advocated for a return to “law and order,” an unsophisticated analogue of old school tough on crime tropes. Attorney General Jeff Sessions is certainly not a ballast to these viewpoints. He has indicated plans to reignite the War on Drugs, a prime engine of mass incarceration and racial disparities therein, and perhaps the most agreed-upon failure in criminal justice policy in the last 40 years. The incendiary climate being created by the White House on criminal justice issues certainly runs counter to our perfect storm argument. There is certainly cause for concern among those of us who aim to advance an era of decarceration. On the one hand, changes in federal policies do not necessarily stall decarceration efforts aimed at state prisons and local jails, which comprise the vast majority of those incarcerated. However, federal funding to states has been a major catalyst for incarceration-reduction efforts in recent decades, and decreases or reallocations of that funding could substantially slow progress. Possibly most concerning is that the response to Trump’s punitive messaging may be embraced by a larger portion of our population than we had anticipated. For these individuals, it is uncertain whether the idea of reversing mass incarceration is unappealing at best and, at worst, antithetical to their view of justice. Very early in its development, the emerging era of decarceration is facing a formidable political challenge. The current political climate and agenda should not be underestimated, but it also cannot be allowed to debilitate initial gains. For this reason, it is all the more important that the work of the decarceration movement intensify and build. “Smart decarceration” remains not only a possibility, but a critically important financial, social, and public safety goal. Featured image credit: prison jail detention fence by babawawa. Public domain via Pixabay. Matthew Epperson, PhD, MSW, an associate professor at the University of Chicago School of Social Service Administration, was a key organizer of the 2015 national conference on decarceration which led to the founding of the Smart Decarceration Initiative. His research centers on developing, implementing, and evaluating interventions to reduce disparities in the criminal justice system. In November they will be holding a second conference on decarceration bringing together individuals from diverse disciplines, experiences, and political views to identify solutions to replace incarceration. 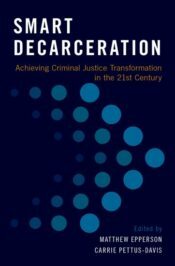 He is the co-editor of Smart Decarceration: Achieving Criminal Justice Transformation in the 21st Century.